Welcome to K-Town! We're home to rice, bears, the best sake on the planet and MORE RICE! Like many other areas in Miyagi, Kurihara-shi is a mixture of 10 small towns that recently merged to become a large, spread-out city. Kurihara City (Kurihara-shi) is a collection of 9 towns and 1 village that merged together into a city (read: "county) a couple years back. Essentially, the towns themselves are still very much the same. The towns are centered around Tsukidate, which is the main population hub and business area. There are two shopping areas in Kurihara-shi located in Tsukidate and Wakayanagi. Tsukidate has a couple of large supermarkets, York Benimaru, and a Big House. There is also a large K's Denki electronic shop and a Yamaya, which is a foreign foods store that sells really cheap alcohol. The small towns also bring beautiful scenery. Lake Izunuma is between Wakayanagi, Tsukidate, and also borders with Hasama (Tome-shi). It’s a beautiful place to relax and enjoy natural life. The main access to the lake is off Route 176. Along this road on the left you will see the Izunuma Sanctuary Center. This center is open on weekends, and is worth a visit if you are interested in the plants and wildlife around northern Miyagi. Another beautiful and popular location is Kurikoma Mountain. It’s about a 40-minute drive from Kurikoma to the top of the mountain. In the autumn the view from the top is stunning and is usually crawling with Japanese hikers in the early mornings. Overall, Kurihara shi is a lovely place to live, from the hustle of the small town-shopping scene, to picturesque hikes up Kurikoma Mountain. It’s rural Japan! Enjoy the scenery, the community atmosphere, and engage yourself within it all. Kurihara-Shi is home to the largest number of JETs in the prefecture. Ten, beautiful and talented masters of grassroots internationalization and offroad driving. While K-Town itself can be sparse at times, it's the ALTs that really make being a Kurihara JET something special. We're Miyagi's attic and proud of it. Don't poke the bear. Though we are a mixture of small towns, we have access to the rest of the nation with our Shinkansen station. It’s a 20-minute ride to Sendai, or a two and a half hour ride to Tokyo. Be sure to check, because not all shinkansen trains will stop at all the stations. We are also connected to JR Tohoku Honsen with a station in Semine. A car is recommended, as most people live a good distance from the closest train station (which don't come that often anyways). Recommendation: Mr. Chiba's Green Honda Dealership. He speaks English, and will help you with a lot of the paperwork, finding a car, buying/selling your car, etc. Very helpful. If you like snowboarding or skiing, you’re in a bit of luck. We just happen to have a small slope reasonably close to us near Naruko called Onikoube. Gasan, Appi, and Zao are a bit further away but offer a lot more variety. If you are really interested in skiing or snowboarding, you might like to ask some others where they like going. There are lots of options in Miyagi. Onikoube is about a 1 hour drive from Tsukidate. You can rent gear on the mountain. There are lessons available in Japanese. I recommend heading to Naruko for a well-earned onsen on the ride home! Yosakoi is an intense Japanese folk dance popular in Tohoku. ALTs are active participants in these groups. There are a lot more extra-curricular activities out here than meets the eye! Just keep asking around and you'll find what you're looking for. Don't forget to hit up your senpai! Waterwheel - This is across the street from the Bunkakaikan (Tsukidate-Kurihara Culture Hall). It has a waterwheel out the front and it is known as the Waterwheel restaurant even though that’s not its name. It has Japanese food with a picture menu. Joyfull, Marumatsu - family restaurants which means they are reasonably cheap. The food is of average quality. Joyfull (yeah, it has two ‘L’s) is open 24 hours. La Bonte - this is a cute restaurant that looks like a log cabin from the outside. It serves mainly Italian food. Felice - opposite the Big House, Daiso, Tostem etc shopping centre. Serves pretty good pizza and pasta. Heiroku Kaiten-zushi (平禄寿司) - We've got two of this conveyor belt sushi chain; one off of route 4 near Green Honda and another in central Wakayanagi. The fish quality is MUCH better than Kappa-Zushi but it doesn't serve as much miscellany. Never disappoints. Open until about 10pm. Ebisu - near the 4 and 398 intersection down a small alleyway. You’ll see the yellow and red sign from route 4. Good for parties and nomi/tabe-hodai (all-you-can-drink/eat). Sawazen- on an intersection with Route 4 in southern Tsukidate. Good nomi/tabe place… a bit more expensive, but worth it. Ju - a yakiniku place on route 4 near the over bridge. Ju and Sawazen are probably the nicest restaurants in Kurihara – but take that with a grain of salt. Kinryu- In Kurikoma near the old station/parking lot. THE best katsudon you will get for 900 yen. We go there a lot and typically get free stuff. The regulars there are a bunch of characters. The Bear Restaurant- It has a real name. We don't care though. Long story short, it's a udon-soba place that serves up bear meat. The owner is a baller in all respects. Used to hunt black bears until his gun jammed and he got mauled. Now he just gets the meat from friends. Sometimes he'll just go down to the river and net ducks. Go there enough and you'll be treated to all sorts of free amazing wild fish and game. Kurumaya Ramen - at the corner of the 398 and 4 intersection. The Tsukidate ALT thinks it’s the best place for ramen in town. It’s pretty cheap, and is a fast eat. They serve good gyoza and also beer and ice cream too. Chinese – 香山 in Tsukidate is across the street from City Hall. It is solid Japanese style Chinese food and is run by a Chinese family. Cheap lunch specials. DO NOT park in their lot if you are late for the bus! There is also a Chinese noodle chain on Route 4 next to the Yellow Hat. The building is yellow and black. Vegish Burger – Kurihara’s only takeout place! They have burger and fries sets, and also pizza. Their pizza is wonderful, probably the best I have had in Japan. Sugar Mama’s – not her real name... just what we refer to her as. Sato-san is the mama who runs this Japanese pub, which is in Wakayanagi. Best fried chicken/chicken fingers I have had in Japan! She also serves buttered and fried mushrooms that are amazing. Ayame Restaurant – this restaurant is near the hollow log and the Sanno Ruins/Iris Park in Ichihasama, on Route 398. It serves basic Japanese fare, their katsu curry is great! Also has a farmer’s market. Fukutokuen - can’t miss it, it has a big picture of a cow and is on Route 398 just after you enter Shiwahime from Tsukidate. Cheaper yakiniku than the more upscale Ju. Palette - There is a cute little café/ bakery called Palette. It is just down the road from the Waterwheel restaurant and you can buy nice little cakes there and coffee. It has an outdoor table which is nice to sit out at on summer days. We’ve bought some good birthday cakes from here. Orange - This place just opened on the second floor above Ju. It has variety of food, including Japanese, Korean, Chinese, Thai, and Italian. Nice atmosphere. A little pricey. The food that comes with the nomi party course is mediocre. Time Café- In Kurikoma. When Route 457 going north ends, turn right. Look for the sign on the right. Serves some good food, and lots of drink choices. The closest thing Kurihara has to a nice coffee shop, I think. Ryutenko- Yaki-niku place is Kannari. The owner, Endo-san, has pretty solid English and loves classic rock. He puts mango chutney in the cow tongue curry. The man is a genius. We go there a lot. It's got all the standard yaki-niku fare, but the servings are beyond generous. Kuri means chestnut and koma is the old Japanese word for horse. Kurikoma is a small town of 15,000 people located in the northwestern Miyagi, bordering our neighboring prefectures, Iwate and Akita. It is well known for the inactive volcano Mt. Kurikoma (1600m). Kurikoma Mountain is a great place to enjoy nature’s presents. There are cabins available at a reasonable price, along with onsens, a pool, sauna, gift shops, coffee shops, and restaurants. Kurikoma Sports Center allows people to enjoy their pool, aerobics, basketball, badminton,and weight training for a bargain of 500yen. Within the town there are some popular restaurants such as Kinryu-beef and Katsudon that has a traditional interior and music that creates a great atmosphere. Genpei is a great sushi place, while Chiroru serves pasta, pizza, gratin, sandwiches and cakes, which might quench a craving within a few months of being in Japan. Yoronotaki has a picture menu with inexpensive western and Japanese food. The Dashi Matsuri is on last weekend of July every year. On Saturday afternoon through the evening you can see illuminated floats, eat festival food, and watch traditional dancing and the carrying of the shrine. The floats parade through town on Sunday. There is also a Hanabi Matsuri (fireworks) in August and a taiko festival in September. Tsukidate is the largest town in the area. From Route 4, you can find grocery stores (Yoku Benimaru, Big House, Yamaya), 100 yen shops, and convenience stores. For beers and a relaxing atmosphere, head to ZEST. Just around the corner is Palette Bakery. 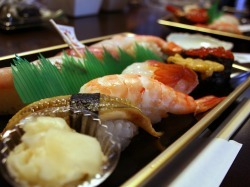 For sushi, visit, Tsuzumi restaurant, along route 398. There’s also a great Italian restaurant off Route 4 near Big House and Daiso. It looks like a log cabin on the outside and serves great pizza and pastas. Yakushiyama is located behind the elementary school in Tsukidate and is visible from Route 4. It has a 1000+ year old tree, a Buddhist temple and a small park which is great for cherry blossom viewing in the spring. There is a festival the first weekend of November, called Yakushi Matsuri, which involves sake and a parade. Rumoured to exist. If you are an ALT there, please share your Ichihasamic wisdom in next year’s welcome guide. Every around setsubun, Ichihasama does a mikoshi parade through the snow-covered streets. The carriers wear nothing but loincloths and the spectators throw buckets of cold water on them as they pass by. Kannari has a population of 7,000 people bringing 2 districts, Kannari and Sawabe together. Between them one can live a simple inaka life without going completely crazy. Don’t worry, there is a Maxvalu, Yakuoko (pharmacy), Homac and a 100-yen shop, the bare necessities. Though it’s a small town, it has a lot to offer. There is a small Russian orthodox church, an old school converted into a museum, and many small shrines. One of the shrines has a Samurai festival every year on the first Sunday in April. There is an onsen at the top of the hill. It is 400yen for entrance and has a lovely view of Kurikoma Mountain. If you travel further up Route 4, you will come to a small store called Agurikko, which sells the BEST ice cream as well as inexpensive vegetables and flowers. Kannari has many rice fields and many views of Kurikoma Mountain. In fall the (rather nice) town festival is held and hosts Kabuki performances and such. From Kannari, it’s only a 15-minute drive to its larger neighbour, Ichinoseki in Iwate-ken. Hanayama is the smallest town in Miyagi in terms of population (1650). But don’t let that get you down! It has 3 onsens and camping facilities. Hanayama is a great getaway for some chilling time due to the lack of nightlife and the fact that most things close by 7 or 8 pm every night. Hanayama has some great things to offer. There is an old guard gate/customs gate by the Nuruyuu Sansou onsen that dates back to when samurai ruled. There are 2 shrines in town; one is close to the elementary school, on top of a hill with an excellent view of the lake. 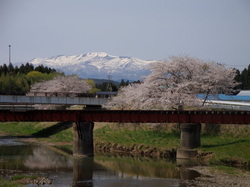 The other is larger and is close to the border with Ichihasama. Close to the JHS, there is a campground that is located beside the Hanayama Lake. You can boat and kayak there. In the springtime, the campground is also a great place for viewing the local cherry blossoms. There are two notable waterfalls in the area, Azabu Keikoku and Shiraito no Take. People interested in pottery, you can visit Mr. Shuji Kudoh. He is a residential potterist originally from Iwate, and he speaks some English. Lastly, there is a house from the Edo period, previously owned by samurai Chiba Shyuusaku. This small, humble and GREAT town makes up for its lack of modern entertainment options with some stunning scenery. It is home of the only hip-hop bar in the area. Lake Izunuma is a lovely area, which is beautiful all year round. Cherry blossom season is probably the best time to check out the river and the lake. There are Yoku Benimaru and COOP supermarkets and a great deal of fun at the Japanese department store JUSCO. There are no fast food joints or big chain restaurants, but there is the Jaki Café, which has a great reputation. There is also a Sports Center, which has a nice fitness room and only costs about 200 yen a visit. Originally a mining town of over 30 000, Uguisuzawa is now one of the smallest towns in Kurihara-shi. With a current population of only 3000 people, Ugu (as it’s been fondly nicknamed) really does epitomize inaka life. There’s nary a supermarket, but a couple of little restaurants and Mama-san’s snack bar ensure you won’t go hungry (as long as you don’t leave it too late in the evening). Although certainly not the bustling metropolis that it once was, Ugu is well worth a visit. This old mining town is very peaceful and ideal for anyone running from the law hoping to lay low for a year or two. Nestled at the foot of mountains, Mt. Kurikoma is a mere stone’s throw away. Lush rice fields stretch in every direction and a river runs through the centre of town. It’s a great place to unwind or take a Sunday drive. There are also some festivals throughout the year. In March, on the first Saturday and Sunday there is the Ume Matsuri festival displaying an amazing range of bonsai trees. In June, there is the Satsuki Bonsai Matsuri, again rows of bonsai trees, but this time in full bloom. Very very low key, but highly recommended to anyone with an interest in bonsai. Another attraction is the Mine Park. It’s open every day except Tuesdays. You can go into the mountain and see mining things or check out the slide park. There is a souvenir shop and a restaurant there as well. Small in population, but huge geographically, this town is known for its abundance of vending machines. There is also a grocery store and a few convenience stores. However what makes this small town unique and special is the Kurikoma Kogen shinkansen station, literally situated out in the middle of rice fields, with the multi-purpose Epoca, plopped down right behind the station. Inside, you will find a gym, an onsen, and a walking pool. The gym has treadmills, bikes and weights. On the first floor of Epoca there is a gift shop which sells inexpensive produce that local farmers bring to sell. There’s also good cake and ice cream in this store. On the second floor of Epoca, there is an Internet café for 100 yen/hour. Also has an amazing AEON which is good for groceries, home furnishings, clothing, and anything else- a godsend. Hmm what to say about Semine? Semine is home to a grocery store and a few convenience stores, but most of all is located right on the Touhoku Honsen JR train line. For less than 1,000 yen, a ride to Sendai is simple and easy and gives you great access to just about anything you need, and many places around the prefecture.